The betta fish, more commonly known as the Siamese Fighting Fish, is a popular freshwater fish because of its brilliant colors and relatively easy care (wild betta fish live in small, dirty puddles, so they are pretty hardy). 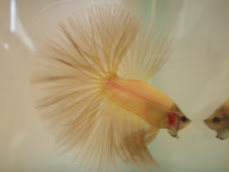 Betta fish care does entail some special considerations that are unique to betta fish (especially a male betta fish) in order to keep him or her happy and healthy. There are three obvious options when filling the tank with water. Tap water is generally safe for your betta fish, but should be left standing for 24 hours in order to condition it and bring it to room temperature. If your city has especially hard water, you may want water treatment chemicals to remove chlorine and other contaminants. Bottled water varies as much as tap water does, and if you choose to use it, be sure to stick to one particular brand. If you do decide to change brands, make the change gradual, adding a bit of the new water to the old water over a couple of days. 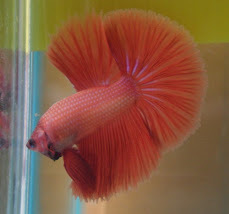 Using betta conditioners is still a good idea. Distilled water should be avoided. The temperature of the water is also important, as the betta fish is considered a tropical fish. Water between 72 and 82 degrees Fahrenheit is ideal but the betta can adapt to lower or higher temperatures as long as the change is gradual. One way to tell if the water is too hot or too cold is by watching the betta fish's behavior. A sluggish, listless fish is likely too cold and a hyperactive fish (unless it is feeding time) indicates water that is too hot. Plants help keep your aquarium stress-free for your betta fish, who likes to rest on the leaves, while gravel make the tank or bowl look more attractive to humans. Make sure you buy aquarium gravel as ordinary rocks from the street or your backyard will not do. Plastic aquarium gems will also be fine. Before adding the gravel to the aquarium, rinse it in a separate container, changing the water out and repeating until it remains clear. Live plants can be bought as bulbs from the pet store or you can prop up some artificial plants in the gravel. Aquarium filters and Aquarium heaters are not needed for tanks less than 5 gallons and actually should be avoided. The gravel in your tank should provide adequate biological filtration in this setup. Everything should be fine as long as you change the water frequently and remove excess food and debris immediately. For a tank smaller than a gallon, change 100% of the water once a day or at least 3x/week. For a larger tank, do partial water changes of 25% of water a week. Be sure to siphon or vacuum your gravel when you change your water. 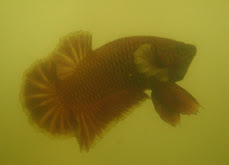 Because the betta fish breathes at the surface of the water, the water does not need to be aerated either. In fact, aeration and circulation may create too much flow for your betta, who are not accustomed to having to swim very hard. If you do buy a heater for your aquarium, invest in a thermometer as well. Monitor the temperature of the water carefully, as extreme or fluctuating temperatures can kill your betta fish. 1. Keep the fish away from direct sunlight and cold air vents on the way home. Bring him home immediately, do not leave him in the car for longer than necessary. 2. Float the bag or jar that your betta fish came home in inside the aquarium or fish bowl you already have set up. This will make the temperature change more gradual. Let it float for some time. 3. Cut open the bag and add a little bit of aquarium water to the bag. Keep the bag floating in the aquarium for about thirty more minutes. (You can use a clothespin to clip the bag to the side to prevent it from sinking). 4. Continue adding a bit more aquarium water to the bag. Repeat this step until the bag is mostly aquarium water. Depending on the differences in pH level between your water and the pet stores water, you may want to take this step a bit slower. 5. Release your fully adjusted betta fish into his new home. 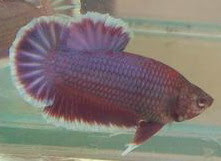 Adult betta fish should be fed once a day and babies should be fed twice a day. It is extremely important not to overfeed the fish. Keep an eye on them as they eat and remove any food that is uneaten when they are done. Generally, a betta fish should take about two to five minutes to fill up, so avoid feeding them more than they can eat in that time. Betta fish prefer live food, but feeding them freeze dried food is a more convenient and affordable alternative. There is special betta food available for daily staple feeding, but always supplement with freeze-dried mosquito larvae - called "bloodworms", or brine shrimp. Mosquito larvae are the betta fish's natural food. Red mosquito larvae are called "bloodworms". Live brown worms and bloodworms are enjoyable to betta fish, but are notorious agents of disease and bacteria, as are most live foods. If you decide to feed live worms to your betta, be sure to wash worms thoroughly. Never feed your betta fish worms from the garden or caught in the wild as they may have been subjected to pesticides. Brine shrimp are also a favorite food of betta fish, and make a good occasional treat for the fish to be fed in moderation. You can feed them freeze dried brine shrimp or hatch them yourself from eggs. Frozen food is a safer alternative to live food, although still not as easy as freeze-dried. * The betta fish, as most fish, can go a couple days without eating, so don't worry about leaving for the weekend. But if you leave for a longer period of time, be sure to have someone feed the fish (or use a time-release food block, or automatic feeder) and clean their water (if smaller than 5 gallons it will need cleaning at least once a week). * It is good practice to skip a day of feeding once a week, as it gives the betta fish's digestive system time to recover and clean itself out. * IMPORTANT: While betta fish will stop eating dried or frozen food once full, they will continue eating as long as there is live food in their aquarium. Thus it is extremely important not to overfeed them with live food, as they will literally eat themselves to death. 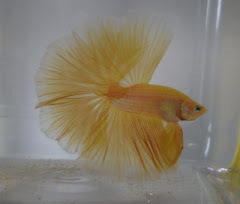 * If your betta fish develops a paunch, or an overpronounced belly, you may be overfeeding it. Conversely, if he appears gaunt or thin, he may have an infection or need more food. The most important aspects of keeping your betta fish healthy and happy is keeping its tank clean. If you are keeping them in an unfiltered bowl or tank over a gallon, change 25% of the water once a week (if smaller, change all the water 3-7x/week - it's nearly impossible to change the water too often in a bowl of that size). You should also remove any debris or uneaten food immediately between feedings. 1. Draw enough tap water to refill the tank 24 hours in advance. 2. Remove your fish from his tank with a net and place him in a tall glass filled with the old tank water. 3. Drain the tank. Wipe down the sides of the tank, removing any buildup. 4. Rinse gravel thoroughly and replace. 5. Rinse the tank thoroughly if you used any cleaners or soap. 6. Refill the tank and gently reintroduce the betta fish. 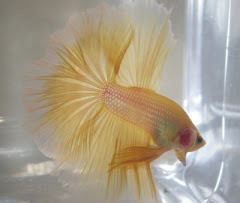 * Males should always be kept away from other betta fish, especially other males. They are highly territorial and will fight to the death. * If introducing a betta fish to a community of fish, avoid inhabiting them with fin nippers or other fish that might irritate or feed on the slow-moving betta fish. * Occasionally place a mirror in front of a male beta fish for some entertaining exercise. However, do not leave the mirror in place for long, as it will exhaust him! * Keep tanks covered. Bettas can jump out of a bowl or a jar. Some plastic or a sheet of transparency paper works fine. * Taking good care of your betta fish means he could live from 2-4 years! Enjoy your feisty friend and keep him in good health.